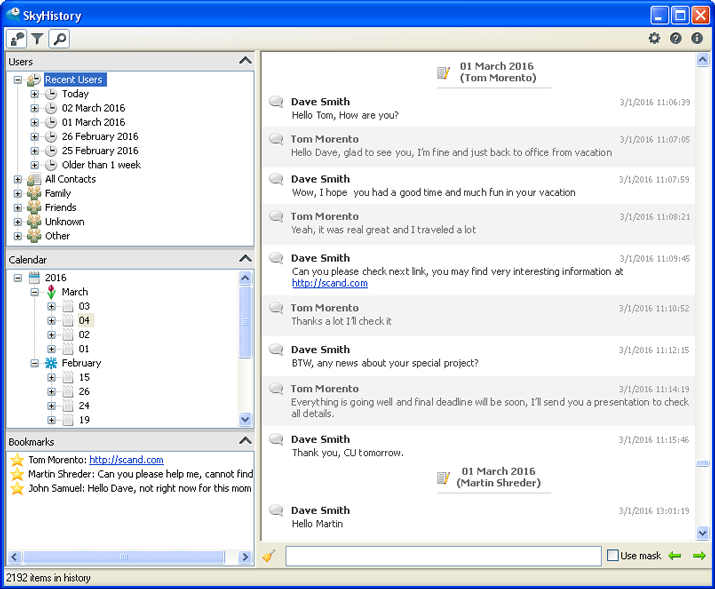 Six years ago SCAND decided to release a new tool that helps to advance efficiency and productivity of your communication via Skype. During this ‘six-year-period’ SkyHistory had its ‘per Aspera ad Astra’ time and finally its glory hour has struck. We are excited to announce the latest highly functional 2.0.0. updated version eventually released on June 2, 2016. Now, thanks to our software developers there is no need to make your way through piles of personal messages and numerous of calls to find some valuable pieces of information you received a couple of days ago. Yes, general Skype history is being tracked, but SkyHistory categorizes all the chats with the date and time. It is available now with our built-in Skype calendar which lines up all the chats in chronological order. Once you found the sought-for chat under some date, go through and bookmark the key messages. Thus, you’ll get the immediate access to this information. One thing that should be mentioned is that this feature is available only for a full version (license purchasing is necessary). Another paid feature is also a search bar to find keywords of important Skype chats when the date of the conversation simply slips out of your mind. The redeeming feature of SkyHistory is its intuitive and straightforward interface. You can download the free version here and browse your chat history with pleasure. Moreover we provide 30-day trial version without limitations. – First of all our app creates a database which imports all previously saved Skype chat history (full version), 5-day chat history (free version). In other words, it works with a separate GUI based chat manager and all your contacts are imported unchanged, including Skype lists titles and the group structure. – Upon your wish, you could sift through what part of chat history will make up the core of your database. In case you have no desire to keep tracking conversations with some contacts you could disable that function. – SkyHistory dev team created an above-average feature: your database could be located on a portable device (stick, drive). It means that any device you are using to get access to Skype will have your Skype viewing tool at hand all the time. Total $19 fee for such a useful tool is not a big deal. Moreover, if you purchase more than one activation key, our discount scale activates automatically. Enjoy using your favorite app with great comfort and have all Skype data protected! Our development team is happy to cooperate and looking forward to being at your service. Please, drop us a line to skyhistory@scand.com.